Vertically aligned carbon nanotube arrays (VACNTs) show a great potential for various applications, such as thermal interface materials (TIMs). Besides the thermally oxidized SiO2, atomic layer deposition (ALD) was also used to synthesize oxide buffer layers before the deposition of the catalyst, such as Al2O3, TiO2, and ZnO. The growth of VACNTs was found to be largely dependent on different oxide buffer layers, which generally prevented the diffusion of the catalyst into the substrate. Among them, the thickest and densest VACNTs could be achieved on Al2O3, and carbon nanotubes were mostly triple-walled. Besides, the deposition temperature was critical to the growth of VACNTs on Al2O3, and their growth rate obviously reduced above 650 °C, which might be related to the Ostwald ripening of the catalyst nanoparticles or subsurface diffusion of the catalyst. Furthermore, the VACNTs/graphene composite film was prepared as the thermal interface material. The VACNTs and graphene were proved to be the effective vertical and transverse heat transfer pathways in it, respectively. Vertically aligned carbon nanotube arrays (VACNTs) have various outstanding performances and show great potential for a wide variety of applications. Due to their high axial thermal conductivity, many VACNT-based thermal interface materials (TIMs) have been developed for thermal packaging applications [1, 2, 3, 4, 5, 6, 7]. To synthesize the high-quality VACNTs on different substrates, chemical vapor deposition (CVD) has been commonly used, and the buffer layer should be deposited on the substrate before the deposition of the catalyst, such as Fe. Generally, the buffer layers are used to prevent the diffusion of the catalyst into substrates, so it is also very important to achieve the high-quality buffer layers on different substrates. Atomic layer deposition (ALD) has self-limited behavior, which could achieve pinhole-free, dense, and conformal films on complex non-planar substrates . Recently, many researchers have used it to deposit the buffer layers for the growth of VACNTs [9, 10, 11]. Amama et al. reported the water-assisted CVD of VACNTs using ALD Al as the buffer layer . Quinton et al. reported the floating catalyst CVD of VACNTs using Fe as the catalyst. They found that VACNTs had faster nucleation rate and more uniform tube diameter on ALD Al2O3 buffer layer, compared with SiO2 . Compared with thermal and microwave plasma SiO2, the VACNTs grown on ALD SiO2 had the fastest nucleation rate . Yang et al. reported that VACNTs could be synthesized on non-planar substrates using ALD Al2O3 as the buffer layer and Fe2O3 as the catalyst, respectively . Compared with the planar surface, the non-planar surface could largely increase the specific surface area, which would be very beneficial for the preparation and further applications of VACNTs [12, 13, 14]. Although some ALD oxide buffer layers have been synthesized for the growth of VACNTs, their role was still not very clear in the CVD process. In this research, we used CVD to prepare the VACNTs with different buffer layers, including ALD Al2O3, ALD TiO2, ALD ZnO, and thermally oxidized SiO2. The effects of different oxide layers and deposition temperature on the growth of VACNTs were analyzed. Besides, the VACNTs/graphene composite film was also developed as the thermal interface material, and the VACNTs were used as the additional vertical thermal transfer pathways in it. 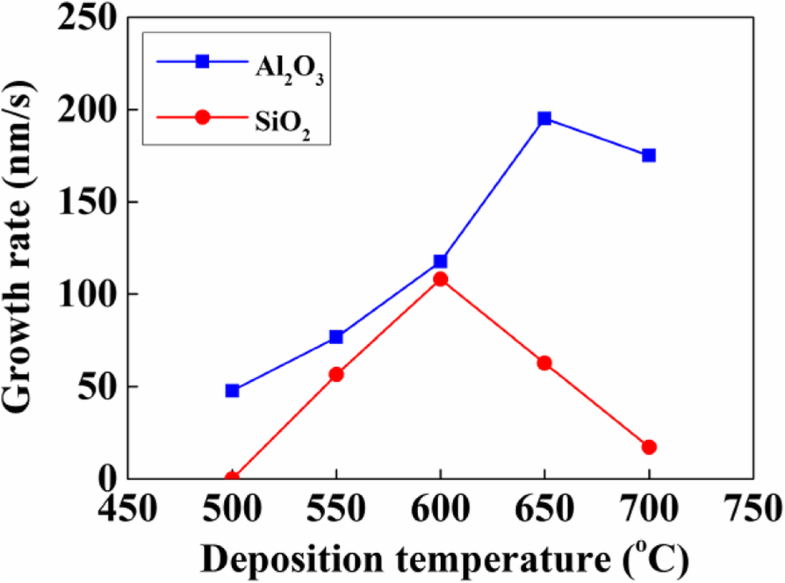 Al2O3, ZnO, and TiO2 thin films were deposited on Si substrates by ALD, and SiO2 was formed on Si substrate by thermal oxidization. Trimethylaluminum (TMA), tetrakis(dimethylamino)titanium (TDMAT), and diethylzinc (DEZ) were used as the precursors for ALD of Al2O3, TiO2, and ZnO films, respectively. For all of them, H2O was used as the oxygen source, and the deposition temperature was set at 200 °C. 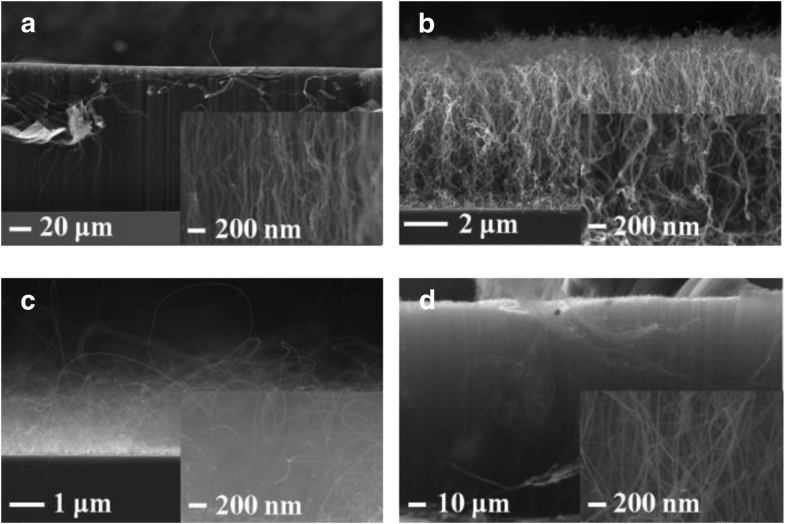 The thickness of Al2O3, ZnO, and TiO2, and SiO2 films was 20 nm. One-nanometer-thick Fe film was deposited on all of them by electron-beam (EB) evaporation, where it was used as the catalyst. The CVD method was applied to synthesize the VACNTs based on a commercial CVD system (AIXRON Black Magic II). Before the growth of VACNTs, the catalyst was annealed in the hydrogen (H2) atmosphere at 600 °C. The period was 3 min, and the flow rate of H2 was set at 700 sccm. After that, the acetylene (C2H2) and H2 were introduced into the chamber, and then VACNTs were prepared. The flow rates of C2H2 and H2 were 100 and 700 sccm, respectively. The deposition temperature was changed from 550 to 700 °C, and the period was fixed at 30 min. After the growth of VACNTs on Al2O3, the VACNTs/graphene composite film was also prepared as the thermal interface material. Epoxy resin, curing agent, and diluents were purchased from Sigma-Aldrich Trading and Tokyo Chemical Industrial Co., Ltd. The multilayer graphene was purchased from Nanjing Xianfeng Nanomaterials Technology Co., Ltd. For the preparation of the composite film, the catalyst was firstly patterned using a lithography machine (URE-2000S/A). The pattern size was 500 μm, and the distance was 150 μm among patterns. Secondly, the VACNTs were deposited by CVD at 650 °C, and the growth period was 30 min. Thirdly, the VACNTs were densified by the acetone vapor, and the period was 20 s. Fourthly, graphene, epoxy resin, curing agent, and diluent were mixed as the matrix, and the amount of graphene was fixed at 10 wt.%. After that, the VACNTs were immersed into the matrix and cured in a vacuum oven at 120 °C for 1 h and then at 150 °C for 1 h. Finally, the prepared composite film was polished to the thickness of about 300 μm, and the tips of VACNTs should be protruded from its both surfaces, as shown in Fig. 1.
where λ and ρ were the thermal conductivity and density of the composite film, respectively. Figure 2 a–d show the cross-sectional SEM images of VACNTs grown on different oxide buffer layers at 650 °C. 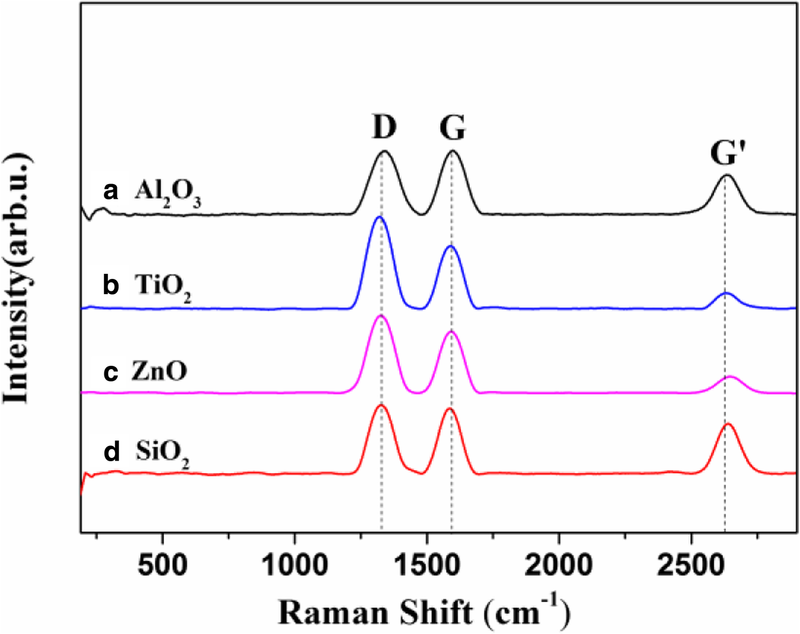 The VACNTs have been successfully prepared on Al2O3, TiO2, and SiO2, as shown in Fig. 2 a, b, and d. Among them, the VACNTs were the thickest on Al2O3, which indicated that the lifetime of catalyst nanoparticles was the longest on it during the growth period. The lifetime of catalyst nanoparticles represents the time after it has basically lost its catalytic function to grow carbon nanotubes, which could be deduced from the thickness of VACNTs . 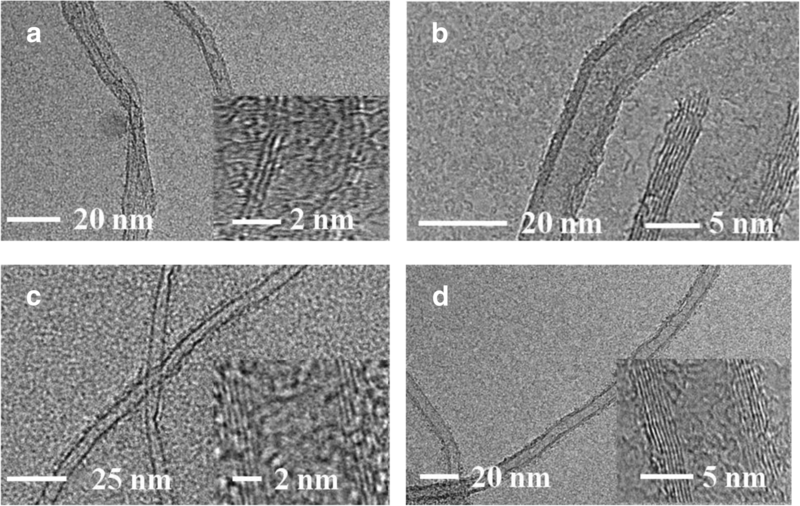 Unlike it, the relatively thin VACNTs were deposited on SiO2 and TiO2, which might be caused by the relatively serious Ostwald ripening of catalyst nanoparticles or the subsurface diffusion of Fe [15, 16]. As shown in Fig. 3, Ostwald ripening is a phenomenon whereby larger nanoparticles increase in size while smaller nanoparticles, which have greater strain energy, shrink in size and eventually disappear via atomic surface diffusion . When a catalyst nanoparticle disappeared, or when too much catalyst was lost, the carbon nanotubes growing from it stopped . Besides, subsurface diffusion of Fe into the buffer layer or substrate could also cause mass loss from the catalysts that grow the carbon nanotubes, eventually causing termination of growth . From Fig. 2 a, b, and d, we could also see that the density of VACNTs was the highest on Al2O3, and the lowest on TiO2. Generally, any marginal alignment seen in CVD samples was due to a crowding effect, and carbon nanotubes supported each other by van der Waals attraction . Therefore, it means that the density of VACNTS was quite important, and higher density generally resulted in better vertical alignment of VACNTs, which were confirmed in Fig. 2 a, b, and d. Besides, Fig. 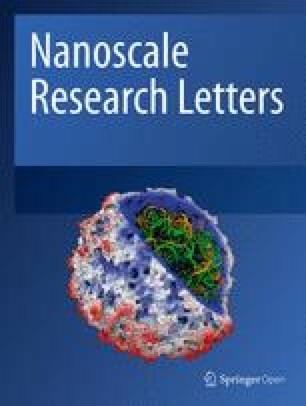 2 c shows that there were almost no VACNTs grown on ZnO, which could be caused by much more serious Ostwald ripening of catalyst nanoparticles and subsurface diffusion of Fe, compared with others [15, 16]. Figure 4 a–d show Raman spectra of VACNTs grown on Al2O3, TiO2, ZnO, and SiO2. Generally, the D, G, and G’ bands were around 1360 cm−1, 1580 cm−1, and 2700 cm−1, respectively [19, 20]. For different oxide buffer layers, the ratio of ID and IG was calculated to be near or more than 1, and there were also no radial breathing modes (RBMs) around 200 cm−1. It indicated that all the prepared VACNTs were multi-walled on Al2O3, TiO2, ZnO, and SiO2. Figure 5 a–d show the morphology of VACNTs on different oxide buffer layers, which was analyzed by TEM. The VACNTs were multi-walled on all of them, which was consistent with the results of the Raman analysis. The VACNTs were mostly triple-walled on Al2O3, but more than four walls on TiO2, ZnO, and SiO2. Figure 6 shows the growth rate of VACNT variation with deposition temperature on Al2O3 and SiO2. When the temperature increased, the growth rate of VACNTs firstly raised and then decreased on both of them. It might be related to the serious Ostwald ripening of catalyst nanoparticles or subsurface diffusion of Fe, which largely reduced the lifetime of catalyst nanoparticles and the growth rate of VACNTs [15, 16]. Above 600 °C, the growth rate of VACNTs still increased on Al2O3, but decreased on SiO2. It indicated that the lifetime of catalyst nanoparticles on Al2O3 was longer than that on SiO2. When the deposition temperature was below 500 °C, there were obvious VACNTs on Al2O3 but no VACNTs on SiO2, which meant that the nucleation and initial growth of VACNTs were more easily achieved on Al2O3, compared with SiO2. It indicated that the activation energy for the nucleation and initial growth of VACNTs on Al2O3 was much lower than that on SiO2. Commonly, each catalyst nanoparticle could produce at most one carbon nanotube, but not all the catalyst nanoparticles could achieve the carbon nanotubes, because the activation energy should be overcome for their nucleation and initial growth [21, 22, 23]. Therefore, compared with SiO2, the lower activation energy of VACNTs on Al2O3 might result in their higher density, which could be confirmed by Fig. 2 a and d.
Figure 7 a shows the morphology of VACNTs with the patterned catalyst on Al2O3. Generally, there still had a lot of gaps inside VACNTs, which were filled with air, as shown in Fig. 2 a. However, the thermal conductivity of air was only 0.023 Wm−1 K−1 at room temperature, so the VACNTs need to be densified to remove it. From Fig. 7 b, we could see that the obvious densification of VACNTs has been achieved with the acetone vapor. 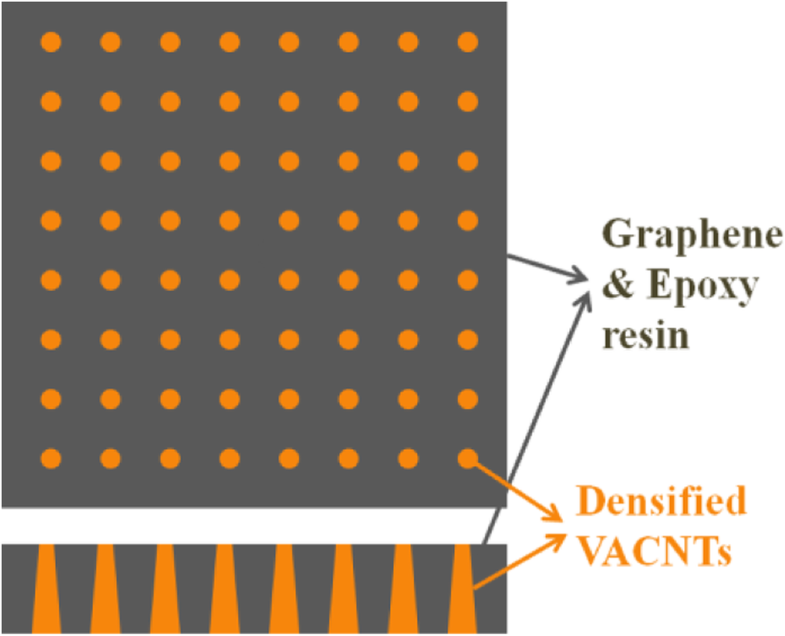 Figure 7 c shows the cross-sectional image of the VACNTs/graphene composite film. The VACNTs and graphene were used as the additional vertical and transverse thermal transfer pathways in it. Figure 8 a and b show the vertical and transverse thermal conductivities of the composite film, which were measured to be about 1.25 and 2.50 Wm−1 K−1, respectively. Compared with the pure epoxy resin, its vertical and transverse thermal conductivities have been obviously enhanced. It confirmed that the effective vertical and transverse heat transfer pathways have been offered by the VACNTs and graphene in the composite film, respectively. The growth of VACNTs has been analyzed on different oxide buffer layers, such as ALD Al2O3, ALD TiO2, ALD ZnO, and thermally oxidized SiO2. Among them, VACNTs were the thickest and densest on Al2O3, which indicated that the lifetime of catalyst nanoparticles was the longest and the vertical alignment of VACNTs was the best on it. Besides, the VACNTs were found to be multilayer on Al2O3, and the deposition temperature was very critical to the growth of VACNTs. Compared with SiO2, the nucleation and initial growth of VACNTs were more easily achieved on Al2O3, which resulted in a higher density of VACNTs on it. After the growth of VACNTs on Al2O3, they were used to prepare the composite film together with graphene and epoxy resin. Compared with the pure epoxy resin, the vertical and transverse thermal conductivities of the composite film have been largely improved. The authors thank Dr. Yong Zhang from the School of Automation and Mechanical Engineering, Shanghai University, for the useful discussions. This work was financially supported by the National Natural Science Foundation of China (Nos. 61704102 and 51861135105). The datasets supporting the conclusions of this article are included with the article. HHL, GJY, BS, XXZ, and HPM designed the experiments and analyzed the data. HHL, GJY, BS, XXZ, HPM, YZT, HLL, and JL discussed the results and contributed to the writing of the manuscript. All authors read and approved the final manuscript.